Previously craftsmen/women were responsible for creating beautiful and or practical objects. Around the time of the industrial revolution these tradespeople were responsible for producing some amazing pieces. Each piece was "unique" in the respect that they were hand made or finished. Mass production was available but nowhere near the scale and impersonal scope of today's manufacturing. In that era, discretion was at a peak, the top horologists very rarely "Branded" their pieces boldly. Rather the signatures were concealed inside the watches, in turn sold to "Watch Makers" and Jewelers shops to resell. Some shops would Brand the faces themselves with their own name. It wasnt until later that "Branding" was pushed by the marketing companies. Sometimes appearing somewhat bland from the outside, the internal workings on some watches are literally "ART", taking months or even years to complete, by hand. . In our opinion, these pieces have been kept under cover, out of sight for far to long. These pieces had a purpose and were a symbol of social standing. Collectors hoarding watches not to be seen by the public purely for financial gain are committing a huge crime. 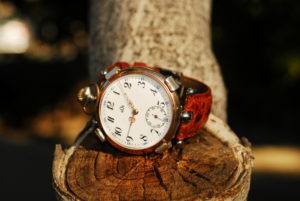 Here at Revenant Watches we believe that watches should be returned to their former glory and prowess. Obviously there are some pieces that justify being "kept safe" under lock and key, but a watch should be used and admired. Always a talking piece, Revenant Watches will capture everybody's attention, it is simply impossible to ignore them. Quality, precision engineering combined with unique animal skins, precious metals, gemstones and craftsmanship. Pieces wothy of only a few deserving people that can appreciate the pieces for what they are.